Members of the public perceive coordinated terrorist attacks that involve multiple actors as more threatening than attacks carried out by individuals, according to a study that includes two University of Kansas international relations professors. "What this suggests is that as a strategy for inciting terror, coordinated attacks are more effective," said Clayton Webb, assistant professor of political science. "On the other hand, coordinated attacks are more difficult to carry out, so the attacks that are most likely to generate a response from the public require more attention to detail and resources. This could have potential implications for terrorism prevention and counterterrorism measures." The journal Dynamics of Asymmetric Conflict recently published the study by Nazli Avdan, assistant professor of political science, and Webb. They examined public perceptions of transnational terrorist attacks to determine which features of these attacks matter most and possibly could put political pressure on states to react. The project came in the wake of the large-scale attacks in 2015 and 2016 in Paris and Brussels. Both attacks involved coordinated bombings and shootings. The Islamic State of Iraq and the Levant, ISIL or ISIS, claimed responsibility for the attacks. According to the Avdan and Webb, coordination serves as a fear amplifier. Organizations capable of coordinating simultaneous strikes at different locations in the same city are perceived as more sophisticated. This influences public perceptions of those organizations' capabilities. Even if groups do not inflict more harm than so-called "lone-wolf" attacks, the sense of sophistication makes the groups seem more menacing. ​Avdan said the findings also indicate the need for the public to be vigilant in the wake of terrorist attacks. "The media and policy practitioners can overstate the sophistication of groups. The public should be discerning when evaluating terrorist events," she said. "Beliefs that the group is sophisticated inspire greater fear." Webb said their findings do indicate the public tends to pay attention to events involving international relations, something that researchers often dispute. "It means that while the general public doesn't get a lot of credit in terms of its ability to discern the key details in international relations, the fact they perceive, and are sensitive to, tactics of terrorist organizations does suggest they are processing reasonably detailed information when they acquire information about international events," he said. The aim of terrorist attacks is to communicate a message to a broader audience than the immediate victims of the attack. Terrorism is meant to put pressure on target governments through the target population. The population may pressure the government to change policies in response to terrorist violence, or the violence may serve to de-legitimize the target government in the eyes of the public because of the government's inability to protect its citizens. Lone-wolf attacks receive a lot of media attention, but they do not communicate a sense of sophistication. "While those inflict harm on the target population, as a political strategy they are not going to be as effective as coordinated attacks," Webb said. Avdan and Webb said their findings contribute to a growing body of research looking at the features of terrorist attacks and the public's perception of terrorism. This could lay the groundwork for future research on the political and security consequences of coordinated terrorist attacks. Their results also could suggest that the Islamic State's tactic of taking credit publicly for any terrorist-type attack is not as effective as a coordinated attack, Webb said. Past research has shown that terrorist organizations tend to learn and be more strategic, so it's possible ISIL or al-Qaida type networks could seek to carry out future coordinated terrorist attacks. Avdan said terrorist groups also seek to paralyze state agencies—for example, the police, public officials, health officials and first responders. And coordinated events, in which they often attack multiple sites on the same day, accomplish this type of paralysis, she said. "The key for responding to that is to build preparedness at the local level," Webb said. 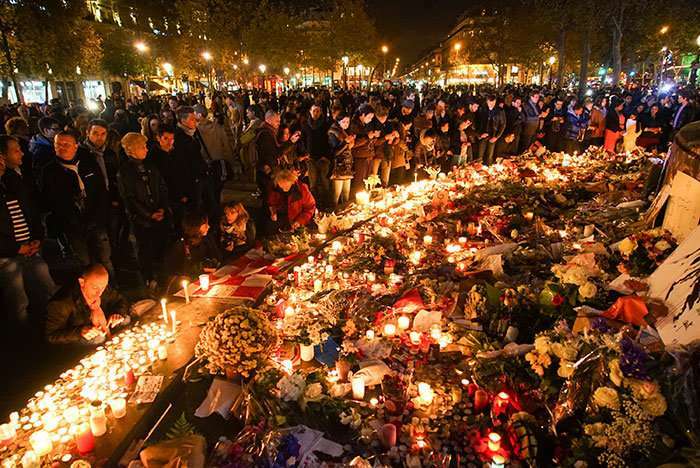 Photo: Mourners attend a civil service Nov. 15, 2015, at Place de la République in remembrance of the victims of the terrorist attacks in Paris two days earlier. Two University of Kansas researchers in a study found members of the public perceive coordinated and sophisticated terrorist attacks like the one in Paris as more threatening and dangerous than so-called lone-wolf attacks. Do terrorist attacks affect ethnic discrimination in the labor market?